In 1995 Kerstin left Canada to work in Japan. She immediately fell in love with Japanese cuisine and its focus on purity and simplicity. Kerstin then moved to New York in 2001 and discovered its extensive food culture. She reconnected with her love of chocolates and began experimenting with new recipes. She took chocolate making classes, and learned everything she could about being a chocolatier. As her passion for chocolate grew, she realized that she wanted to spread the message of gourmet chocolate to others. When Kerstin moved back to Edmonton in 2003, she decided to start a chocolate business, and so Kerstin's Chocolates was born. What does Kerstin's Chocolates do? We have developed a line of quality chocolates that are reminiscent of Kerstin's childhood favorites, updating them with fresh ideas. 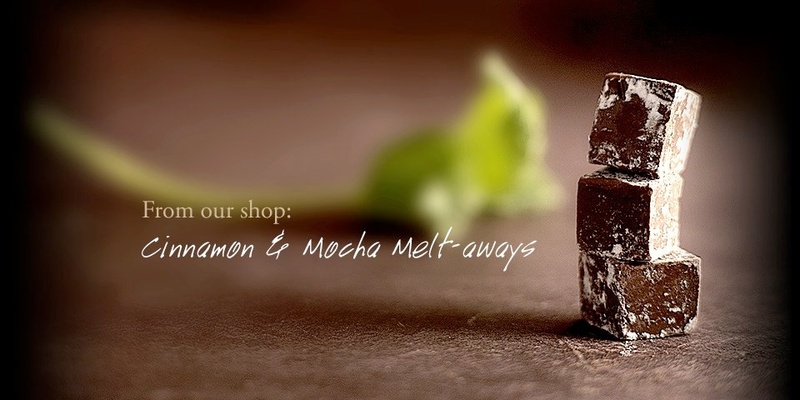 These gourmet chocolates, the ChocophiliaTM line, are all hand-made by Kerstin and her team in Edmonton. Kerstin also offers chocolate tastings for the general public and for private groups that help participants learn the art of appreciating gourmet chocolate. Finally, Kerstin's Chocolates imports fine chocolates from artisanal chocolatiers in Europe and North America. These products have not been available to chocolate lovers in Alberta until now. They are all available at our retail locations, for purchase online or by phone/fax. Q1: Where does the chocolate you use in your Chocophilia bars come from? A1: We use chocolate that is processed by one of the world's smaller chocolate manufacturers. It is roasted and refined in a factory in Switzerland. The beans are grown in specific cacao producing regions (Ecuador, Venezuela and Madagascar), blending beans only from that region. The beans are all Criollo type beans, except for the Ecuadorian chocolate, which is a Forastero type called "Nacional". We purchase this chocolate in bulk and use it to make all of our products. We use only two manufacturers as sources for our chocolate: Felchlin (Switzerland) and Valrhona (France). These are two of the best chocolate makers in the world, and their attention to detail and artistry allow us to create the best chocolates possible. Q2: Is the chocolate in ChocophiliaTM bars certified Organic? A2: Our chocolate is not certified Organic, but in general, cacao trees are one of the lowest users of synthetic pesticides/herbicides and inorganic fertilizers. Cocoa trees are actually very finicky and produce more and better beans on smaller plantations that leave the trees in their original environment. We have been searching for certified organic chocolate that meets our requirements for flavor and texture, but have yet to find any. Q3: Is your chocolate certified Fair Trade? A3: Short answer: No. Long answer: We sell and work with high quality, mostly single origin chocolate from world-renowned chocolate makers. To obtain such a high quality, these companies either own the cocoa plantations that provide the beans for their chocolate, or they work with small farmers on a direct trade system. This way, they can control the conditions under which the cocoa beans grow, as well as rely on the expertise of the cocoa farmers. So we are almost 100% sure that none of the chocolate we work with or sell in our shop comes from large plantations that sell on the open market and have highly questionable labour conditions. Often, products labeled "Fair Trade" come from fair trade initiatives. While this system is fantastic, the people in these initiatives are not necessarily trained in how to make high quality chocolate. There are a few high-end chocolate makers who have gone through the "Fair Trade" certification process. However, that has made the price of their chocolate extremely high and we think that it would be hard to find people willing to pay that much. We are still keeping our eyes open to find high-quality fair trade chocolate. Meanwhile we have the assurance of our suppliers that they treat their farmers as ethically as possible. We get many questions here at Kerstin's Chocolates, and we like to answer as many as we can. Please send any questions you may have on our Contact Us page.